Carl Eller Moose #81 (1964-1979), and Robert Rutan, developer of RemZzzs® and CEO of Naturs Design Inc. A few months ago Carl was diagnosed with sleep apnea and began using RemZzzs® with his CPAP mask during therapy. A few months ago I participated in the May 2014 Sleep and Wellness Conference in Scottsdale, AZ., sponsored by the ASBA (American Sleep & Breathing Academy Medical & Dental Divisions). The focus of the 3-day, multi-disciplinary event was to bring together experts in the field of sleep medicine, sharing their collective knowledge, experience and solutions for Sleep Disordered Breathing. During the conference, I met the developer of RemZzzs Mask Liners, Bob Rutan. 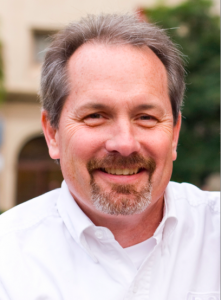 Randy Clare, Sr. Consultant/Management in Respiratory at CareFusion is a mutual friend, and thought we should meet. As the Founder and President of the Pro Player Health Alliance organization, one of our goals is to help former and current NFL players by providing testing and treatment options for those suffering from sleep apnea. I am always open to new products that will help our retired pro-player members. It was while talking with Bob Rutan, we both realized that combining our efforts, working together through the Pro Player Health Alliance, we could reach and help a larger group of not only pro-players, but sleep apnea patients nationwide as well. Bob and Debbie Rutan have an interesting and unique story to share, one that will sound familiar to many. I’d like to share it with you. “After struggling for several years with the effects caused by lack of sleep, my wife Debbie was diagnosed with Obstructive Sleep Apnea (OSA). The sleep study was the easy part; the ability to wear her CPAP mask comfortably and actually get some sleep was a completely different story! Aside from the fact that my wife’s face would get hot and sweaty, her mask continually lost its seal and frequently made a sound like a “squealing balloon”. “How can we live like this?” we asked ourselves. Like many of you, we’d searched online for solutions…only to discover that countless others were living through these same sleepless nights. “Try removing all lotion from your face,” “Tighten your mask,” or “Try a different mask” were the suggestions given by therapists. Sound familiar? We tried them all, and none worked. Each morning my wife would have puffy eyes, red marks on her face, and she was more tired and discouraged than ever. After months of battling with the fit of her CPAP mask she was about to give it up. I’m excited about PPHA’s involvement with RemZzzs® “It’s a Game-Changer,” a campaign to help former and current NFL players and Sleep Apnea patients nationwide to become successful with CPAP therapy. 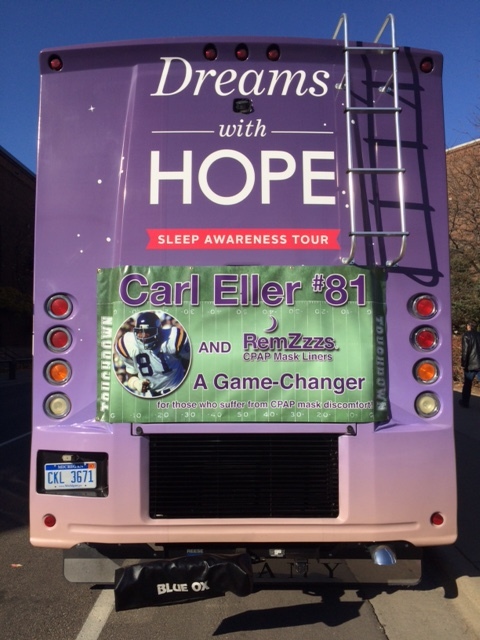 Through PPHA, RemZzzs® just contracted NFL Hall of Famer and former Minnesota Viking, Carl Eller “The Moose” #81 to be their spokesperson. Carl was diagnosed with sleep apnea and put on CPAP. He is currently wearing the Resmed Quattro Mask full face, after wearing the mask for several weeks, Carl noticed it was leaking and causing skin irritation. Bob Rutan immediately stepped in with the RemZzzs® mask liner and it was the perfect solution. Carl’s mask no longer leaks and he is enjoying the best sleep of his life. 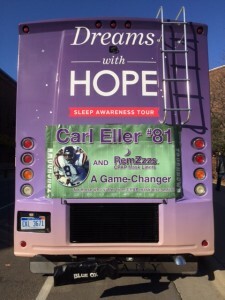 Look for the big purple RemZzzs® bus tailgating at the Nov. 2nd Vikings home game, Carl Eller will be in attendance to help promote RemZzzs® and sign autographs! To receive the Carl Eller discount on your CPAP mask liners, please visit www.remzzzs.com and enter Carl81. The post Blood Pressure and Glycemic Control Better with CPAP appeared first on Sleep Diagnosis and Therapy.